About 100 species, in tropical and temperate regions, very numerous in America. Besides the following, several others occur in the southern and western United States. 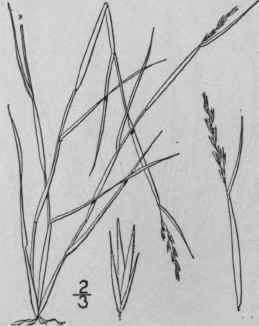 Type species: Agrostis indie a L.
Spikelets 2" long; flowering scale pubescent. Spikelets 1 1/4"-1 1/2" long; flowering scale glabrous. Panicle occupying but a small part of the plant. Leaves glabrous or nearly so. Palet simply acute, about as long as the flowering scale. Spikelets 2" long; inflorescence slender. Spikelets 2 1/2"-3" long; inflorescence stout. Leaves, at least the lower ones, papillose-hirsute. Panicle occupying 1/3-1/2 of the plant. Plants with long creeping rootstocks. Panicle open, its branches spreading, at least at maturity (sometimes contracted in no. 15). Annuals. Empty scales but little shorter than the flowering scale, usually pubescent. Empty scales 1/2 as long as the flowering scale, glabrous. Spikelets 1" - 1 1 /2" long; empty scales ovate to lanceolate. Spikelets 1 1/4"-1 1/2" long, purple. Leaf-sheaths naked, or sparingly ciliate at the throat; panicle usually exserted. Leaf-sheaths densely pilose at the throat; base of the panicle generally included. Spikelets 2"-3" long; first scale subulate, much narrower than the second. Culms from long running rootstocks. First scale of the spikelet 1/2 as long as the second or less. First scale about equalling the second. Culms erect, simple; leaf-blades elongated. Culms decumbent and branched below; leaf-blades short.